Signtech graphics provide a large range of durable pavement and free standing signs to suite your needs, size and budget all supplied with high grade vinyl graphics applied to both sides. 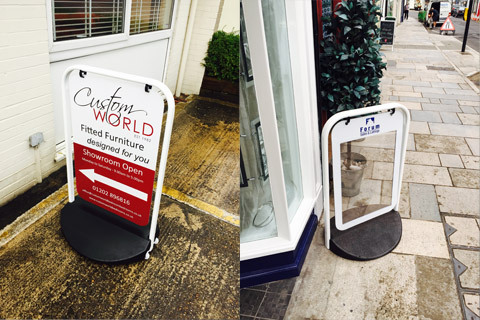 Beyond the traditional shop front sign, why not get additional advertisement with a pavement sign for maximum impact. Many pavement signs we supply can be seen across the land in exhibitions, car parks, shopping centers and airports. 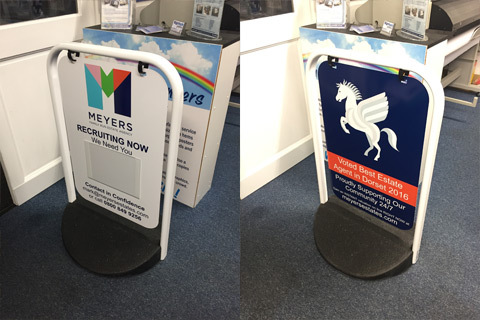 We can also supply larger free standing signs for longer viewing distances, or just to make a bigger impact.